Keeping homes warm and safe since 1979! London Fog Chimney Sweeps is metro Detroit's premier Chimney and Fireplace Company including Livonia, Canton, Garden City, Novi, Westland, Farmington Hills, Bloomfield Hills and surrounding areas. We offer a wide variety of chimney and fireplace products and services to accommodate all your Installation, Restoration, and Maintenance needs. 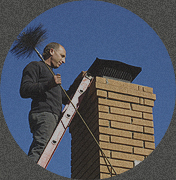 Simply put, our professional staff provides the very best chimney care available. The pride we take in our craft is reflected in the quality of our workmanship. When you contact London Fog Chimney Sweeps, you are assured of fast, reliable service performed in a friendly and courteous manner. Our company is fully insured, with a $2 million liability policy for your protection. And we follow the guidelines set forth by the Chimney Safety Institute of America for all chimney installation, cleaning, and inspections. Established in 1979, London Fog Chimney Sweeps was certified by the Independent Safety Commission in 1983. Since then, we have served thousands of households in southeast Michigan — including Detroit's mayoral residence, the Manoogian Mansion. London Fog Chimey Sweeps has been featured on the Ask The Handyman Radio Show with Joe Gannon at WXYT AM, on WDIV Channel 4's Ruth to the Rescue, and The Detroit News HomeStyle. Protect your investment with the experts at London Fog Chimney Sweeps.